Johnny thinks stuff like this is stupid but he said I could post it if I put that disclaimer at the top. 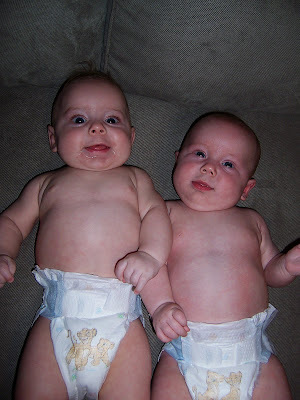 That said, my sister found this great diaper deal and I just had to pass it on. You have to send in a rebate, but they deliver the diapers to your door and you can't really beat that! Your first order is definitely cheaper than Costco. If you do it, you save money and I get credit towards diapers and let's face it... I go through LOTS of diapers around here!! Really though, there's no pressure I just think it's a great deal. So the diapers come out to $39.98 with the ten dollars off. THEN... print out this page and send it in with your receipt for a $14.97 rebate from Parenting Magazine. That comes out to a grand total of $25.01 for 162 Huggies size 5's (you even get more diapers if you order a smaller size). If you like Luvs the deal is even sweeter and comes out to like 10 cents a diaper. i am soooo doing this. thanks for the tip. i'll put your code in-nothing shameful about getting a great deal! Thanks for the deal and I always love helping out a friend. Dax is killing me with size 6 diapers, so anyway to save money makes me happy! I was just stressing out about how much we pay for diapers a month that I might just do this deal.... just teasing. I won't make you put up with my crap either. If I had babies I would buy some. Sorry i can't get you a great deal! Love ya. ps I had a dream that you lived in idaho and I went to visit you... wish it was true!